Bonn, Mar 22 (Just News): A new type of United Nations gathering – the Global Festival of Action for Sustainable Development – has brought together key players of sustainable development, change-makers and innovators from across the globe to share the latest approaches, tools, and initiatives to the achievement of the SDGs in Bonn, Germany. “This Festival is a perfect example that solutions can come from everywhere and even though there is much to accomplish, connecting and building a strong SDG Action Network is how we will achieve the SDGs", said the Global Director of the UN SDG Action Campaign, Mitchell Toomey, durint the opening plenary. "There are so many people here today - some of you have traveled long to be here, some are connected virtually from across the world - that I feel inspired by you, who are united by your drive and will to act and who are creating and catalyzing real change”, he added. More than 160 speakers will share their insights at more than a 100 substantive sessions, talks, and workshops during the Festival. 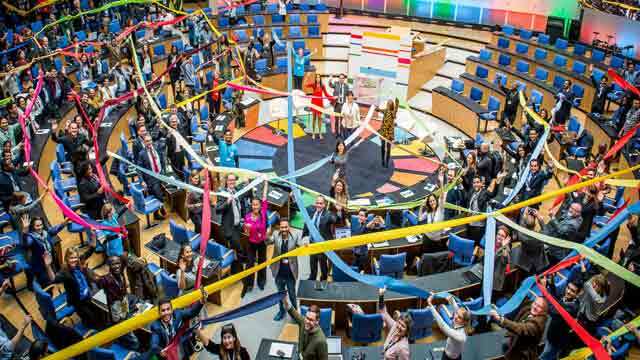 Hosted by the UN SDG Action Campaign with the support of the German Federal Government, the second edition of the festival has grown not only in size but also in representation and inclusiveness. More than 1,200 participants from over 150 countries will attend the event in the next three days, including civil society, the private sector, academia, activists, youth groups, the media and international organizations. The event opened today with a series of inspiring talks and calls to action from Toomey; Dr. Ingolf Dietrich, Commissioner for the SDGs at the German Federal Ministry for Economic Cooperation and Development (BMZ); H.E. Princess Adejoke Orelope-Adefulire, Senior Special Assistant to the President on SDGs for the government of Nigeria; Aya Chebbi, co-founder of The Voice of Women Initiative and founding Chair of the Afrika Youth Movement; global influencer Yusuf Omar, co-founder of Hashtag our Stories; and Y?, the world number 1 beatboxer. “This is what is so special about this Festival and the SDG Action Network that it brings together. We´re engaging at the intersection of policymakers and grassroots boots on the ground. Sharing our goals is not only the responsibility of governments, companies or civil society. It's all of the above. The Global Festival of Action connects and creates space for all key essential doers and drivers of positive change to overcome the barriers and obstacles, and create systematic change together.” said Toomey. “The SDGs are the blueprint for a better world. The Global Festival of Action is a meeting place for the doers and drivers of SDG action,” said Amina Mohammed, UN Deputy Secretary-General, while thanking the participants gathered in Bonn through a video message. Another big novelty of 2018’s Festival is the UN SDG Action Awards Ceremony, which will celebrate and recognize outstanding achievements and innovative efforts to ignite action on the Sustainable Development Goals. Held in tandem with the festival, the ceremony is a platform to recognize some of the greatest innovators, mobilizers, connectors, storytellers, communicators, visualizers and includers from across the globe, learn from them and help them thrive. The Global Festival of Action for Sustainable Development delivers a multitude of formats also present at its predecessor, the Global Festival of Ideas, but this time with a stronger focus on action and partnership building to implement the SDGs. This year’s main program revolves around five main key themes: innovative approaches, citizen engagement, communicating the SDGs, mobilizing action, and multi-stakeholder engagement. Immersive festival experiences including an innovation fair, a virtual reality zone, a Film Festival, a SDG cooking show, games, workshops, beatboxing training, as well as a variety of demo sessions and a groundbreaking film selection round up the program. Adding up to the regular sessions, the SDG Studio presents short and snappy talks, cross-generational interviews and discussions throughout the course of the Festival.